Commercial vest-based camera stabilizer systems are quite expensive, sometimes bearing price tags in the $700-$800 dollar range. Photographer [Miguel Vicente] has a pretty well-stocked workshop and decided there was no way he would shell out that much cash for a rig, so he simply built his own. “Simply” is a bit of a misstatement, to be honest. The system looks relatively complex, judging by the build videos embedded below. Constructed of steel tubing, custom-built springs, and a really snazzy vest, the rig is adjustable in almost every direction. He has tested its capacity up to 2.5 Kg (roughly 5.5 pounds), though he says it’s pretty unruly to manage at that weight. [Miguel] says that 1.5 Kg (3.3 pounds) is a far more reasonable limit, and that the stabilizer works quite well at or below that weight. While it looks pretty good to us, he says that there are plans to improve the design even further. One particular point that he wants to address is the ability for the stabilizer to accept asymmetric camera setups, i.e. cameras with attached lighting and microphones. Stick around to see a short “highlight” film of the build process, as well as a video featuring a more thorough documentation of the stabilizer’s construction. Interested in more DIY camera equipment? Check out this overhead camera dolly and this DIY gimbal mount we featured a short while back. R/C cars can be tons of fun, but sometimes the fun runs out after awhile. [Gaurav] got bored of steering around his R/C car with its remote, so he built an interface that lets him control the car using two different motion-detecting devices. 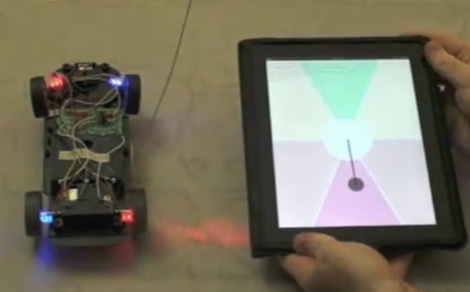 He built an HTML5 application for his iPad, which allows him to steer the car around. As you can see in the video below, the application utilizes the iPad’s tilt sensor to activate the car’s motors and steering depending on where on the screen he has moved the guide marker. The second steering method he devised uses his Kinect sensor to track his movements. His hand gestures are mapped to a set of virtual spaces similar to those which the iPad uses. By moving his hands through these areas, the Arduino triggers the car’s remote just as it does with the iPad. The actual remote control interface is achieved by wiring the car’s remote to an Arduino via a handful of opto-isolators. The Arduino is also connected to his computer via the serial port, where it waits for commands to be sent. In the case of the iPad, a Python server waits for commands to be issued from the HTML5 application. The Kinect’s interface is slightly different, with a C# application monitoring his movements and sending the commands directly to the serial port. Check out the video below to see the car in action, and swing by his site if you are interested in grabbing some source code and giving it a try yourself. Maker [Dino Segovis] has started on a project he calls “Hack a week” where he will be putting together one hack or project per week, for a full year. The first installment of his video series was finished just two days before April Fool’s, and appropriately enough covers the construction of a circuit you can use to prank your friends. 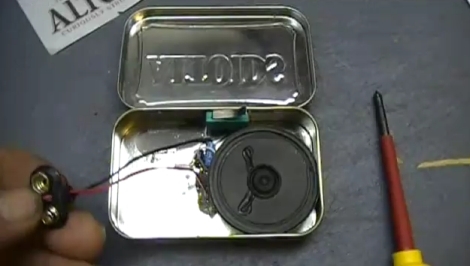 The “Altoids Screamer” is a simple circuit based on a 555 timer that he built into a standard Altoids Tin. The 555 timer is used to generate a loud pitched squeal whenever the tin is opened. This is accomplished by wiring up the 555 in astable mode, and connecting it to a speaker to output the sound. A micro switch is installed inside the tin to detect when the top has been opened, triggering the “scream”. While it’s not the most complex circuit we’ve seen, it definitely gets the job done and is easy enough to build in time for tomorrow’s festivities. It is a great hack for the office, the library, or any other quiet place. Continue reading to watch [Dino’s] first Hack a Week video demonstrating the prank’s construction. If you are interested in some more of his work, be sure to check out this automatic ball launcher and this other 555 Screamer toy. Think Geek has a growing pile of returns and damaged product that they’re trying to get rid of. The purveyors of technological oddities, like any other large retailer, sometimes have stuff that doesn’t work right, or has been damaged somewhere between factory and consumer. The broken bits find their way back to the distribution center and now they’re stuck with the task of doing something with it. They can’t sell it, and we’re happy to say they don’t want to throw it out. So they’re considering giving it away to worth-while causes like Hackerspaces and schools. Looks like no real details have been hammered out as of yet. But if you belong to a Hackerspace or other group that can find a use for this stuff, click-through the link above and sign up to let them know you’re interested. The goldmine of reusable stuff is located in Columbus, Ohio and pick-ups might be available. Otherwise they’re going to need to find a way to cover the cost to ship boxes to those interested. Don’t forget to document your projects and let us know what you use this stuff for. [Valentin] bought a small battery-powered cube speaker with a built-in amp some time ago, but didn’t have much patience for replacing or recharging the batteries. It sat on the shelf for awhile until he decided to revive an old MP3 player he had sitting around. He gutted a pair of solar garden lamps, retaining the solar panels, the built-in charging circuits, as well as the included rechargeable batteries. 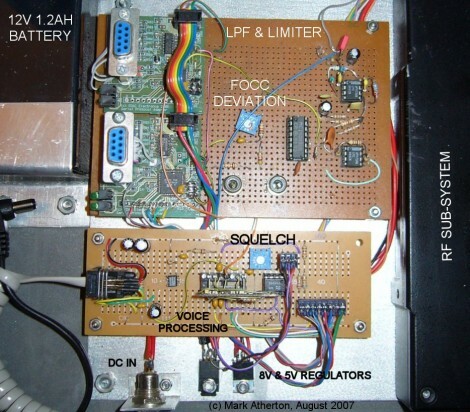 The MP3 player was disassembled, and its components were built into the speaker enclosure. The player’s buttons were relocated to the outer shell of the speaker box with a few pieces of wire, allowing him to easily control his music without having to build in a method for opening the case. Both the speaker and the MP3 player are powered by the batteries salvaged from the solar lamps, which is why he opted to mount both of the solar panels on the the side of the speaker enclosure rather than just one. 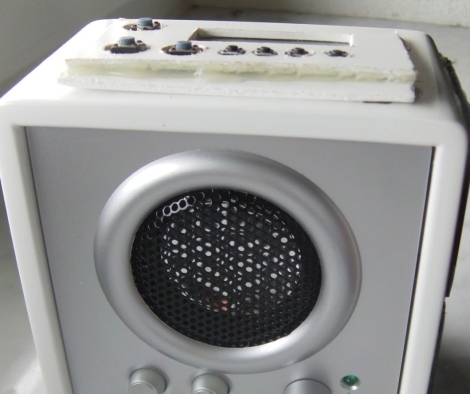 We like it even though the speaker looks a bit rough at the moment, especially where the MP3 player’s buttons were transplanted. After a few minutes of touch-up work however, it’ll look great. If you’re interested in some more solar hacks, check out this solar-powered junkbot, these solar toys for kids, and this solar-powered WiFi repeater we featured in the past.